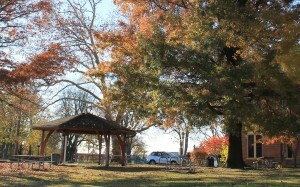 Bayne Park is home to the Jim Porch Gazebo. Located behind the Library right off the driveway, this covered space offers picnic benches, beautiful views of the park, and easy access to the playground equipment. It is a wonderful spot to host birthday parties, reunions, and more. No alcohol is permitted in the gazebo or on park premises. The gazebo offers two electrical outlets. The Library does not provide grills, however, you may bring your own. Any charcoal or propane used must be taken home for your disposal. Please do not dispose of it in the Park or in the Park trash cans. Gazebo users must clean up all refuse and deposit it in one of the receptacles available in the Park. Bouncey houses or other inflatables are not permitted. Gazebo users are responsible for any damage to the gazebo structure. The Library restroom is for Library patrons only. A portable bathroom facility is available in the Park for gazebo users. it is located on the other side of the Library parking lot. Use of two parking spaces is permitted while the Library is open. Parking is available along Teece Avenue. The park closes at dusk. Gazebo users are asked to vacate the area at this time. The gazebo will not be booked until payment is made at the Library and a rental contract is signed. Checks can be made payable to Andrew Bayne Memorial Library. Please bring a copy of the rental contract with you on the day of the event. The Jim Porch Gazebo rents on a per day basis. The cost for Bellevue residents is $22.00 (proof of address will be required at the time of payment). The cost for non-residents is $36.00.